Making a successful horror movie is no mean feat - if people are going to be shelling out money for eerily dark interiors and ghoulish faces, they need to be getting their money's worth on the fear factor. 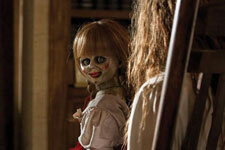 Far too many directors confuse stomach-churning gore and easy jump-scares with genuine, fear-inducing horror. While they have their merits, cheap thrills are no longer enough to bring in the dollar bills. David Sandberg's Annabelle: Creation manages to do what the first movie of the franchise failed to - it creates an atmosphere of darkness and dread that gradually settles over you like a blanket, but stops short of losing its effectiveness by becoming suffocating. Sandberg avoids relying on heavily made-up faces popping up or ear-splitting noises, opting instead for clever camera work and a soundtrack that augments the suspense but does not overwhelm it. 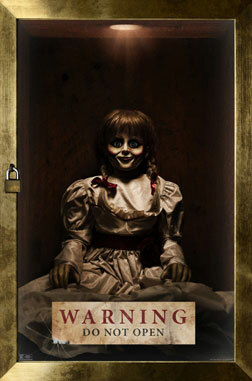 The film gives the demonic Annabelle doll a backstory - like almost all ghost stories, this one starts with a death. What sets it apart from countless others is the thin but strong note of emotion that ties all the characters together. You feel empathy for those involved instead of simply rolling your eyes at the cliché. The beginning sets the dark and sombre tone well, priming you for the remainder of the movie. The movie revolves around the mysterious Mullinses and the group of orphaned girls who come to stay with them (along with their caretaker, Sister Charlotte) when the couple decide to make their home an orphanage. The girls soon realise, however, that being adopted into a loving home is the least of their worries. Their new house is less the princess' castle they believed it to be and more a house of horrors, complete with creepy dolls, faceless scarecrows, secret compartments and little girl ghosts - all in all, the complete list of Things To Look out For While House Hunting. Each of the new residents have some unsettling experiences, but choose to stay in denial and write them off as flights of fancy. Janice (Talitha Bateman), however, gets the worst of it, isolated as she is from the rest of the children due to her polio-affected legs. The film preys on the primitive fears of the human psyche, the thoughts that frighten you in the middle of the night but which seem silly by the light of day - the fear of tight, enclosed spaces, the fear of looking out into the pitch blackness and seeing something horrifying. It exploits a person's natural aversion for simple things like strange dolls, dark wells and the eerie, echoing laughter of a child. The terror gradually escalates and builds to a crescendo, culminating in a climax that lacks a certain amount of finesse but has you jumping in your seat with your heart hammering in your chest without a moment's respite. Despite all the points in its favour, Annabelle: Creation does have its share of flaws. While the cinematography is mostly a win, the scenes can get a tad too dark. The perpetually shadowy hallways of the house are at odds with the bright, sunny California days, disconcertingly so. What takes away from your enjoyment of the movie the most, however, is the unrelenting stupidity exhibited by nearly every single character. Apparently, everyone fancies themselves a Ghostbuster, because what other reason could you have to repeatedly return to the room of a dead girl after being ambushed there by floating sheets and dolls fond of staring contests? Any sane person would have fled the scene screaming. Despite the questionably written characters, the casting is exceedingly well done. Anthony LaPaglia (Mr. Mullins) suits his gruff and grief-stricken role, and Miranda Otto (Mrs. Mullins) plays her tragic and rather disturbing part well. Stephanie Sigman is adequate as Sister Charlotte, but her portrayal lacks heart. Philippa Coulthard and Grace Fulton deliver satisfactorily as Nancy and Carol. The younger girls steal the show, however, carrying the weight of the film's success on their small shoulders. Samara Lee is chilling as the eerie, spectral Bee. Lulu Wilson is perfect as the brave, spunky little Linda, arguably the most likeable character of the film. Talitha Bateman's performance is mature and believable. The contrasting natures she depicts are respectively piteous and menacing, both rendered in an intense and nuanced way. Annabelle: Creation is a welcome addition to the cinematic universe created by James Wan (director of The Conjuring and Annabelle), not to be missed by horror movie buffs. This horror universe is not far behind the Marvel and DC CUs, complete with origin stories, recurring characters and call backs to real life (keep an eye out for the Raggedy Ann doll, a nod to the true story behind Annabelle) - there are even two post-credit scenes, so don't be in a hurry to leave once the credits start to roll! Be the first to comment on Annabelle: Creation (Hindi)! Just use the simple form below. fullhyd.com has 700,000+ monthly visits. Tell Hyderabad what you feel about Annabelle: Creation (Hindi)!